Braving icebergs, the schooner Bowdoin sailed 2,800 miles last summer along the route charted by Admiral Donald MacMillan on his twenty-six Arctic trips. By James P. Brown. Photographs by Tom Stewart. Kennebunkport’s best-selling novelist Kenneth Roberts was a card-carrying curmudgeon — and proud of it. By Jack Bales. On a farmstead once owned by Scott and Helen Nearing, an energetic couple pursues their own vision of a sane and simple life. Photographs by Lynn Karlin. Bar Harbor residents still alk about the moming in 1914 when the town awoke to find a treasure-laden German luxury liner anchored just offshore. By Nan Lincoln. A farewell to Thursday-night softball on Kezar Lake: The spirit was willing but the flesh grounded out. By David E. Morine. Celebrated for his zany portraits of his dogs, photographer William Wegman summers with his models in a rustic lakeside cottage. By Beth Crichlow. One of Maine’s grandest summer hotels, the Black Point Inn adheres to the standards — and comforts — of an earlier day. By Deborah Dalfonso. A visit to the famous lighthouse can be one of the most rewarding excursions in Maine. Best advice: take it slow. By Michael Uhl. I can’t say I’ve never seen a moose I didn’t like because I haven’t seen enough to make a sensible judgment. By Caskie Stinnett. 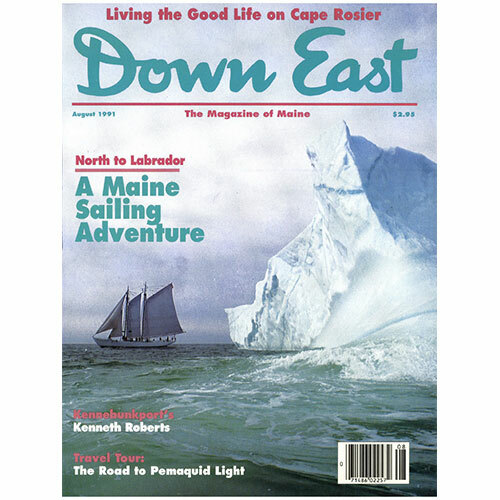 Cover: Riding the seas in a small inflatable boat, photographer Tom Stewart captured this once-in-a-lifetime portrait of the restored Arctic schooner Bowdoin emerging from behind a monumental iceberg off the coast of Labrador last summer while the vessel was on a Maine Maritime Academy expedition.